More than half – 55 percent – think upper income Americans pay less than their fairshare of taxes. Only a quarter says higher income people pay the right amount in taxes. 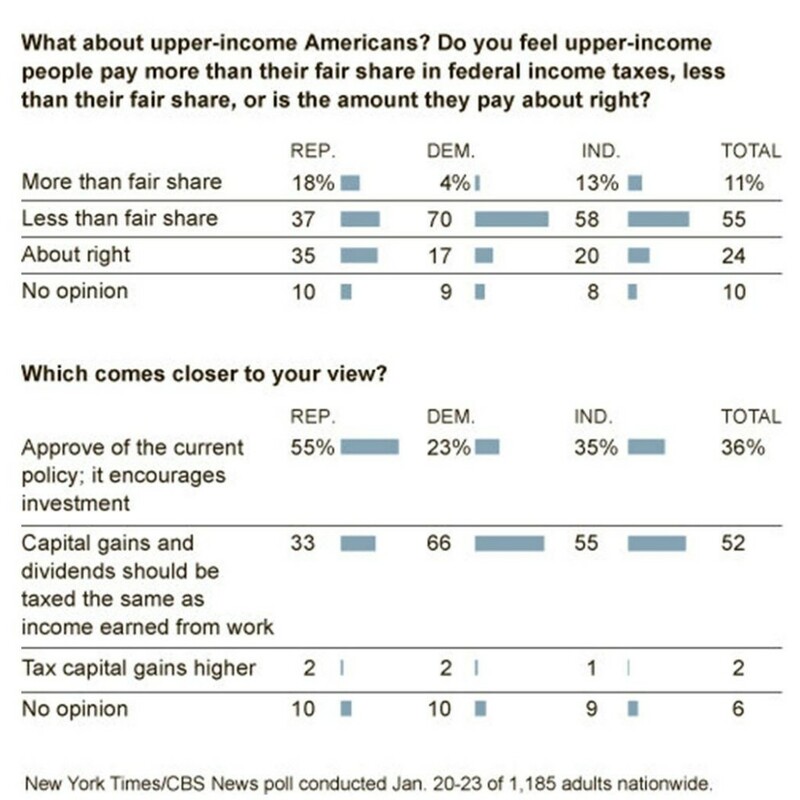 Also as you can tell from the polling results, when you isolate the independents (those that identify with neither the Republican or Democratic parties), the number of those that believe that upper income people are not paying their fair share goes up to 58%. Here is the link to the CBS analysis of the poll and here is the link to The New York Times breakdown of the poll. When Americans talk about folks like me paying my fair share of taxes, it’s not because they envy the rich. It’s because they understand that when I get tax breaks I don’t need and the country can’t afford, it either adds to the deficit, or somebody else has to make up the difference – like a senior on a fixed income; or a student trying to get through school; or a family trying to make ends meet. That’s not right. Americans know it’s not right. This entry was posted in Featured Story, National News and tagged income inequality, majority of Americans, poll, taxes. Bookmark the permalink. « What is ‘vulture capitalism’? © 2012 by Project Economic Refugee	/ Proudly powered by WordPress	/ Theme: thebox by design news.